Our fans have been very kind to us all this while. They have been providing feedback & suggestions in order for us to improve. 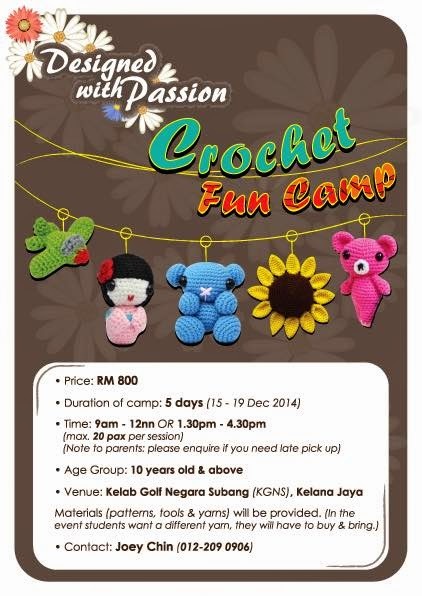 We will be organizing our very 1st Crochet Fun Camp from the 15th – 19th December 2014 at KGNS, Kelana Jaya. We have 2 time slots: 9am – 12nn or 1.30pm – 4.30pm. For parents who require late pick up after the camp, we can accommodate as well, but please inform us upon sign up. We also encourage campers to come in pairs….what better way to enjoy something fun with someone you are close with, right? We will be giving a 10% discount for those who come in pairs or group. you can come with your parents, kids, siblings, relatives or friends. there is no restriction! A little introduction of the instructor: Joey is a mother to 3 wonderful kids who designs, crafts & sells beautiful items out of yarns. Her dream is to re-introduce Crochet as a fun & yet relaxing activity to everyone who is interested. She was a business development professional, and now in the midst of pursuing her dream, one baby stitch at a time. She holds a Certificate of Good Conduct, issued by the MOFA Malaysia. Joey created the brand “Designed With Passion”. As the name says it, this is where all items are carefully designed & hand-crafted with lots of patience, passion & love, for she believes everyone is special & deserve all the special attention! ← Congratulations to All Winners!